I have a mixed relationship with McDonald’s. I know from the nutrition information that the meals that I find the tastiest at its franchises are also the highest in fat and lowest in nutrition for me. 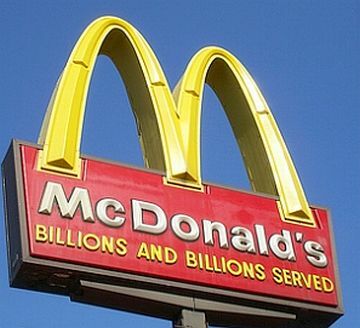 Nevertheless, the Golden Arches are so convenient, so quick, and generally so clean and efficient that it is hard not to stop by to see the clown when I am traveling. And did I mention tasty? Though many might disagree with my culinary assessment, 64 million customers in more than 100 countries stop by every day for hamburgers, french fries, McRibs, pita bread (Middle East), McRice (Indonesia), and soup (Portugul). These massive sales are growing at a rate of 5% per year despite an unrelenting activist war against the company by advocacy groups who object to high-fat, tasty foods (think Super Size Me). In fact, McDonald’s lives in a symbiotic relationship with these protest groups. Holman Jenkins explains the unusual relationship between McDonald’s and nutrition advocates: McDonald’s spends 2 billion a year on advertising and brand-building. To build a brand is to create a hostage, and a full-time activist industry has evolved to expropriate a small sliver of this value to promote its own causes. For example, the American Academy of Child and adolescent psychiatry ran full-page ads demanding the company retire its mascot clown, Ronald McDonald. These ads generated millions of dollars of free publicity for the activist groups for their quixotic attack. 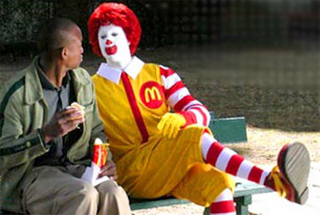 Nevertheless, Ronald is going nowhere. McDonald’s only changes what it does in response to customer tastes and appetites — generally in a way that defends sales of hamburgers and fries to the public. CEO Jim Skinner frames the health activists concerns this way, “Customers feel more comfortable knowing healthier options are on the menu even if they don’t choose them.” Net income $7.5 billion in 2010 suggests many people must agree with his assessment. To underscore this point, global sales have grown for the past 92 consecutive months despite the financial crisis. Even so, there is a problem whenever millions of tons of unhealthy food is consumed every day. McDonald’s cannot be blamed in a free market for providing a menu that customers find to be tasty. The responsibility lies with the consumer, gentle reader. The Bible is clear that people are morally responsible for everything we put in our mouths: “So, whether you eat or drink, or whatever you do, do all to the glory of God” (1 Corinthians 10:31). I know it can be a challenge to be a biblically-informed eater, but look for future posts in this blog on how to practically live out commands of eating and drinking for the glory of God and how to end the obesity epidemic.